Describe the feature you'd like to see included in Oxygen. 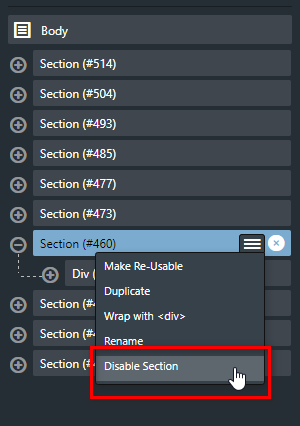 To be able to disable a Section or a Div in the back-end. So it won't appear in the front-end but will still be available in the back-end. (and I don't talk about adding a 'display:none' to that section). When you are designing a page, sometimes you try different versions of the same section and you (or your client) are not sure which one you prefer. So it's a good way to still keep a copy of that section in your back-end. Without duplicating the full page or creating a Reusable part. Examples of this feature or functionality. Definitely useful if this would cause these specific sections not to be output on the front at all (not just hiding it). The idea in the FB group to be able to disable according to mobile, tablet or desktop would make it more useful. I was also thinking of double click and change the name of section, instead of clicking burger icon and select rename. A great idea. Would also need an "Eye" icon to quickly monitor which section(s) is/are hidden.